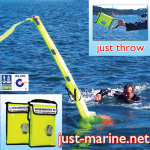 We are the USA distributors of new man overboard gear for MOB marking and MOB recovery. 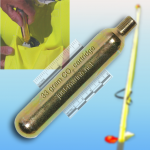 Invented in Australia, these products leverage new technologies to enable quick, easy rescue. 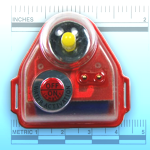 Reach for the man overboard buoy, or dan buoy, the instant you lose a crew overboard. Then Just Throw it toward your overboard crew. 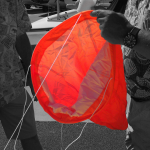 Once his position is marked with this self–inflating MOB buoy, your crew will be easier to see, find, and recover from the water. 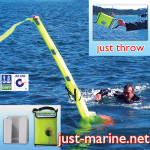 Use as you would a man overboard pole, except this unit has all components in one easy to throw package you JUST THROW. 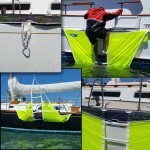 This is a man overboard retrieval device designed to help you pull the MOB alongside, then onboard. 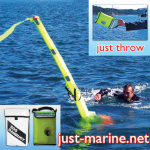 It provides 21 pounds of buoyancy, has light reflective tape, 160′ of floating line with a light reflective strand, and has a sturdy lifting handle. 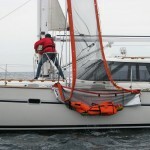 The Reelsling also doubles as a lifting harness for lifting non–hypothermic crew onboard, using a halyard and winch or windlass, or a block and tackle. Once you have located your MOB and returned to him, he needs help getting back onboard. This innovative product is affordable and it enables two types of MOB recovery. Able–bodied overboard crew can use this as a ladder; by climbing the rungs, they can reboard the boat. 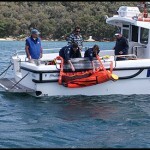 Injured or hypothermic overboard crew can be parbuckle lifted aboard. Parbuckle lifting halves the lifting load and has the advantage of hoisting the hypothermic victim horizontally. Sideways lifting is an important detail of recovering hypothermic crew from overboard. 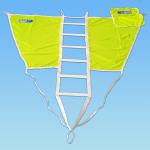 This dual–use MOB recovery ladder is soft and light, therefore crew friendly. 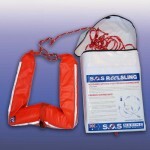 A swimstep or rigid boarding ladder can severely injure crew when the boat rolls. 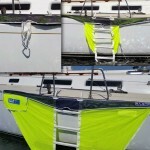 You can click to a MOB recovery gear comparison, including citations of relevant World Sailing and US Sailing requirements.